287 pages. Born poor in the wake of the Korean war, Lee Myung-Bak was destined for a life of poverty. But through intelligence and self-determination, he excelled in school, putting himself through college, hauling garbage six times a day to pay for tuition. He then took a low-level job at Hyundai, an organization of about 90 people at the time. 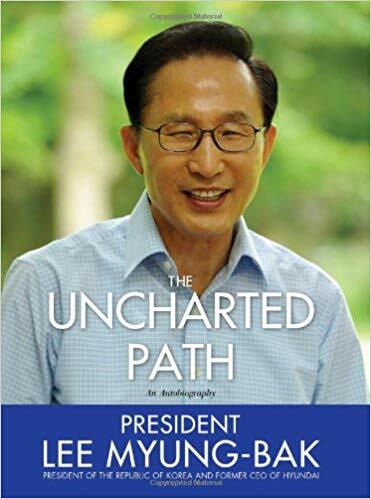 Through a relentless work ethic and inability to compromise his beliefs, he rose to the role of CEO and found himself on a mission not just to expand the Hyundai corporation, but to grow South Korea from a nation of poverty to a G20 economy. The Uncharted Path is the story of a man and nation driven to greatness by a conviction to liberty, commerce, and the belief that at the root of every success lies extreme perseverance and uncompromising principles. These principles and lessons would lead not only to success in business, but also developed a refreshing and unique perspective on the state of our globalizing world, and how nations and businesses must operate together to improve the lives of people everywhere.